Working on creating a custom dialer UI. I'm using this previous post, http://forums.runrev.com/viewtopic.php?f=27&t=34. This works, sort of, however the user has to click on the notch and not the dial to spin the control. Is there any any way to create the group object and make the whole top surface of the dial rotate the notch when dragging? You could always do some quick math between the mouseLoc and the loc of the notch and then just do as you are currently doing.. Would just need to do an additional check to ensure that the mouse has not moved outside of the dial.. However, there still something I'm not completely understanding about your suggestion. The complete dial is two objects the notch, which moves around the dial, and the static dial. As I'm thinking this type of interface would be nice on a tablet, accuracy of where the user's finger is touching is not too important provided they are touching on a part of the dial image. put thePercent into cd fld "readout"
The percent is still reported to the cd fld "readout" albeit a little more jerky in its reporting, but the actual notch graphic does not move anywhere on the dial. I believe this is because the constrainCircular call contains the move, or grab calls? Since I am not actually clicking on the notch the constrainCircular call is not moving the notch graphic. I am not sure if this is correct or not? There probably is a better way to do this, but I was looking for a simplified strategy for creating a custom UI dial and thought AE might be able to simplify the process. Is there a way to actually move the notch graphic using ConstrainCircular without actually clicking and dragging the notch graphic? One thing though, when testing in simulator, when I changed the script to a touchMove command the notch image would not animate correctly. When I switched it back to mouseMove the notch animated correctly in the simulator. Actually I left the notch script with the mouseMove and the dial graphic with a touchMove and noticed the mouseMove worked but the touchMove did not work correctly. That was how I discovered mouseMove worked in the simulator. I will try on actual iOS device and see if that is the case on the actual device. 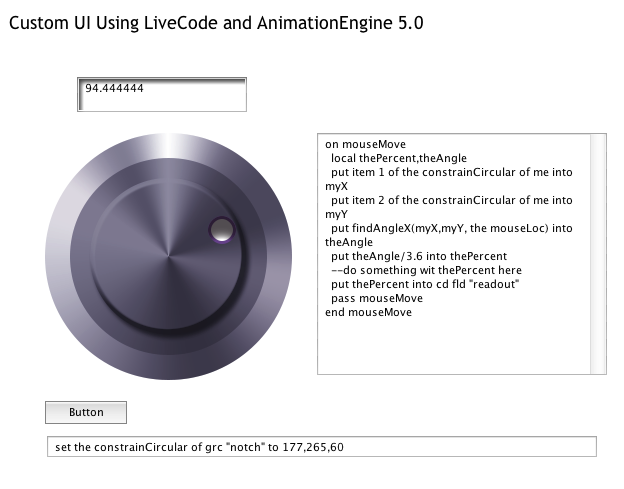 If it is, then that leads me to believe that MouseMove is being translated correctly to touchMove by LiveCode. Well, mouseMove does get translated on mobile devices, however, only the *first* touch event is translated. This might be a desirable effect, but sometimes it is not. touchMove has an additional parameter for the touch ID (which touch was it) so things are a little trickier there. You can see how I handled this for the constraining handlers in the animationengine sources if you are interested.